We have disappeared for a few months due to our extreme condition of in-between moving to a new office which has been always on delay for many months. Actually we have many things to update on the blog, but just did not have time. Today we come back with a long-been-postponed-to-be-featured project, an exhibition design (again) in Frankfurt. The exhibition was ISH 2009 in Frankfurt, Germany, supposedly the biggest international sanitary ware trade fair. The space given is about 3 x 12 m. An interesting condition given by Department of Export Promotion who was the main organizer from Thailand, was to use recycle or recyclable materials – I guess it was from the strict Eco-Friendly German. 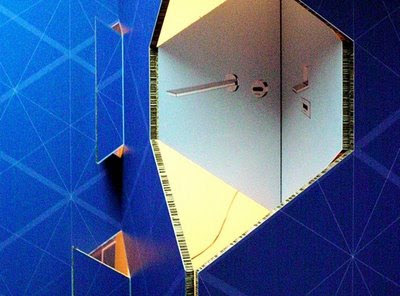 We began to search possible materials to be the structure / main display of the exhibition –> it has to be light, easy to assemble with no extra labour involved apart from the exhibitors. 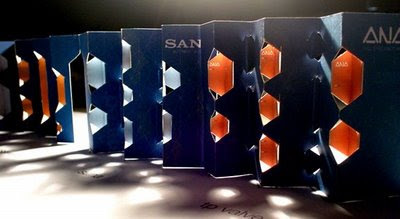 Within few days, we found, Xanita, a company produces honeycomb recycle paper board. It is very light, quite durable if used indoor only. The super nice thing is Xanita teamed with another company that can print and cut them very accurately with CNC machine. So we had endless possibility. Not to mention, the staffs of the company who were very enthusiasm and helpful – thanks to them! 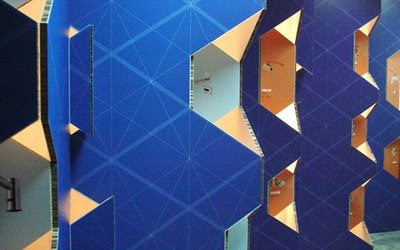 We did many small prototypes of folding cutting papers to have the sheets standing themselves without any extra structures and finally came up with this type. With the zigzag form, inward and outward, the sheet could stand without any problems. Here is the prototype, experimenting with some lighting. 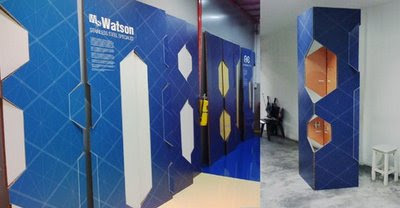 The clients, apart from SANA, were WATSON, ANA and VN, (all of them were the manufactures of sanitary ware in Thailand) liked the prototype, but asked to make it a bit more colorful. Tatan, my ex-student, who is an expert on Thai traditional architecture and decorative elements, gave us some helps on the proportion of the patterns and colors. So here is the final prototype. We then sent the drawings / artworks to be in production. Within fews days only, we got the panels. 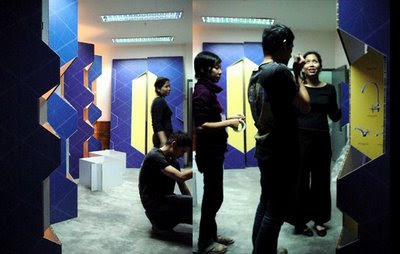 Then at our previous office, we assembled all the 28 panels with 3 people (us), it took only 2 hours.. not bad indeed. The real panels looked pretty much similar to the prototype. As you can see from the comparison here. The whole exhibition filled up our space on the ground floor completely, rather nice.. 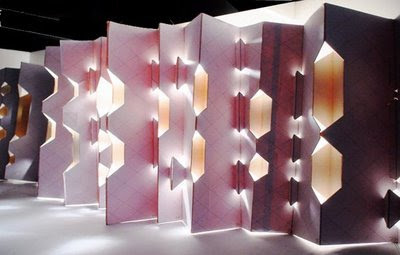 The very simple form of folding in and out create quite nice effects with lighting. The details are very simple. You can see the honeycomb section of the paper here. 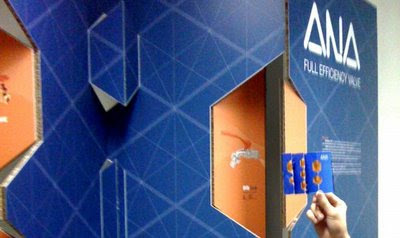 Finally the boards were shipped to Frankfurt on time – thanks god! The exhibition was during the last March. None of us went along, but heard from Khun Wichai that it went well. This was one of our experiments with ‘green’ materials without being outspokenly green as a color or exposed materials of brownish paper. Go Green, without being so ‘green’!